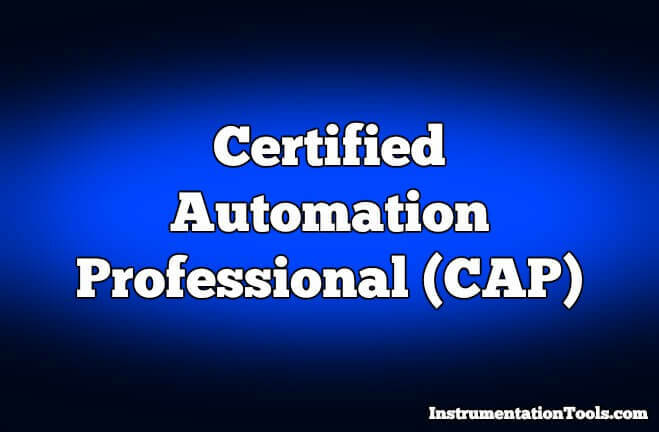 The International Society of Automation (ISA) provides sample Certified Automation Professional (CAP) Exam Questions and answers for engineers who are planning to get certification from ISA. The correct answer is C . To scale the analog input, calculate the “% of the raw counts range” that is represented by the analog input, and multiply by the EU100% range, since the EU0% value is 0. For a 14-bit input with no sign bit or diagnostics bit, the maximum number of counts is (2^14 – 1), or 16383. Since the analog input card raw counts are for a 0-20mA signal, we need to determine the number of raw counts that represents a 4-20mA signal. 4mA is 20% of the 0-20mA range, so the raw counts that correspond to a 4-20mA signal: (20% x 16383) = 3277 counts at 4mA and 16383 counts at 20mA. Therefore, the span of raw counts is (16383 – 3277) = 13106 counts. Therefore, the percent of range of the current analog value is = (Raw Counts – 3277) / 13017. Multiplying by EU100% gives us the scaled analog input value. The correct answer is C , “turbine meter.” Turbine meters almost universally use a magnetic pickup to determine the number of rotations of the spinning turbine element. Each time a magnetized blade passes the pickup sensor, a pulse is generated. The volumetric flow rate can be determined by counting the number of pulses in a unit of time. Answers A, B, and D are not correct; each of these flowmeter types generally produces an electrical signal, with a magnitude that is proportional to flow rate. Each of these flowmeter types could be outfitted with a transmitter capable of transmitting pulses, but only the turbine meter from the choices above naturally generates pulses (with frequency proportional to flow rate). If a hacker intercepts and changes set point data traveling over an industrial network, which basic security property is affected? The correct answer is A, integrity. Data integrity implies that the data received is the same (value, format, quality) as the data sent. If a hacker is successful in changing set point data as that data travels over the network, the hacker has compromised integrity of the data, since it is no longer the same when received as when sent. Answer B is incorrect, because functionality is not a basic security property. Answer C is incorrect, because the problem statement did not address the availability of data. It appears that only the value of the set point (data integrity) was affected. Answer D is incorrect, because defensibility is not a basic security property, but rather a measure of the vulnerability of a system. The correct answer is A. In regenerative braking, all of the motor’s energy is fed directly back into the AC power line. This is accomplished through the use of “reverse-connected” SCRs, which allow the drive to conduct current in the opposite direction and oppose the rotation of the motor, bringing it to a quick stop. Answer B is incorrect, because mechanical braking is not an electric method for braking a DC motor. This is a mechanical method, which uses friction to stop the motor shaft once power has been removed. Answer C, ramp to stop, is an electronic means of stopping a motor over a longer period of time. A high-wattage bank of resistors transforms the rotating energy into heat, thereby dissipating the voltage generated by the motor, slowly bringing the motor to a stop. Answer D, coast to stop, is the slowest way to stop a motor, and is accomplished by simply removing the motor current and allowing inertia to bring the motor to a stop. In the maintenance sequence, the technician often knows what the needed resources are before going to fix the device or equipment, as in a known transmitter failure. The technician’s challenge is to restore the device to service as quickly as possible. Which definition below, according to the maintenance sequence, defines the quantity “restore time”? The correct answer is C, “time to troubleshoot/diagnose/isolate + travel time + repair time.” The restore time includes all activities required to diagnose and repair the device. This includes diagnosing the problem, isolating the device from the system, travelling to the device, and repairing the device. Repair time includes removing/repairing/replacing the device, aligning/adjusting/calibrating the device, and testing/restarting the device. Answer A is not correct, as work order closure is not required to restore a device to service. Cleanup, work order closure, and return to shop are activities that occur after the restore time period. Answer B is not correct, because testing time is included in the repair-time activities. Answer D is not correct, because restore time requires additional activities to be completed beyond the repair-time activities, as described above. D. Steady state process simulation. B. Resistance temperature detector (RTD). Which of the following is NOT a variable speed drive setup parameter? A. Comments for the application programmer. B. Multiple test cases for each mode of operation. C. At least five test cases for each test. D. Expected results for each test case. A. Failure rates of components. B. Availability of personnel and parts. C. Management targets for efficiency and productivity. D. Effectiveness of maintenance personnel. Using Modbus, what is the MAXIMUM level of precision available? How is PID defined in the phrase “PID control loop“? The graphic display for a distillation column in a refining train would BEST fit in the HMI Display hierarchy at which level? What ISA RP12.4 (NFPA 496) defined type of pressurization system will reduce the classification within an enclosure from Division 1 to nonhazardous? What is the MOST appropriate technique for modeling linear relationships for a large number of correlated inputs where the equations are unknown? What is the recommended limitation in meters for the length of a “fast Ethernet” (100 Megabits/second) segment on twisted pair cable? According to NFPA (National Fire Protection Association) Electrical Standards for Industrial Machinery, which of the following actions is NOT acceptable for emergency operations? Which of the following standards applies to the development of embedded software for a SIL 3 certified safety system? Which of the following protection techniques is acceptable for equipment located in a Class I, Division 1 area? Which of the following control valve body styles is MOST likely to develop blockage in a paper pulp slurry service? Given R= Ρ L/A What is the resistance of 1,000 ft of copper wire (specific resistance = 10.37) given a cross-sectional area of 10370 cmil and a wire temperature of 20°C? An application includes a VFD that implements a V/Hz method of torque control while maintaining a fixed V/Hz ratio. The motor has a nameplate rating of 460 volts and 60Hz. If the drive is operating at 30Hz, what percent of rated torque will the motor MOST likely develop? Which of the following MUST be performed to reveal a normally undetected fault in a safety system? Which of the following control strategies works to measure disturbances and compensate for them before they cause the controlled variable to deviate from the set point? Define the purpose, scope, and objectives. Which of the following is NOT a benefit of using an agenda for discussions? What is required to find the MOST efficient operating points that are highly dependent on complex shifting process conditions, such as equipment fouling? Which of the following contract types places the PRIMARY risk with the supplier? Which fuse has the quickest response to over currents? Considering a 60 Hz power source, at what speed does a four-pole synchronous motor run? An increase in which setting can compensate for a thermowell lag time? If the distance in a sheet line from the thickness gauge to the manipulated diebolt actuators is 200 meters and the speed is 4 meters per second, then the dead time from the transportation delay for thickness control is __50___ seconds. Cross the wires at 90 degrees. In a motion control application, which of the following signal types would be able to indicate both direction and velocity? Which of the following statements about fuzzy logic controllers is true? What is the uptime for this automation system if it runs 24 hours a day, 365 days a year? A control circuit within Field Control Panel #1 (FCP-1) in your facility is malfunctioning, and you must initiate a work order to have a technician troubleshoot the circuit. FCP-1 contains a PLC, terminal blocks, circuit breakers and fuses, and various other control equipment, of which none exceeds 120vac. The technician will be working on energized electrical conductors and circuit parts and performing voltage testing on the live circuits. On the work order, you will be required to state under which NFPA 70E-2009Standard for Electrical Safety in the WorkplaceHazard/Risk Category this work activity falls. Per NFPA 70E-2009 Standard for Electrical Safety in the Workplace, what Hazard/Risk Category should be defined for the above task? Common terms used to quantify dangerous failures include which of the following? What is the primary pitfall in using this ROI ratio to make a decision as to whether or not to invest in an automation project? It ignores the time value of money. Which of the following statements describes a database record? Which of the following is not part of receipt verification? Which type of communications error protection and correction uses a complex polynomial that results in a frame check sequence being added to a message? Translation of data between a networking service and an application, including character encoding, data compression, and encryption/decryption” is the responsibility of which layer of the open system interconnection (OSI) model? Which of the following security risks is LEAST likely to disrupt operations at a geothermal power plant and result in an emergency situation? Which of the following statements describes an advantage of a self-study workbook for operator training? What is the significance of the field bus intrinsic safety concept (FISCO)? The definition of ALARM includes which of the elements? A two-wire loop with a loop power supply of 26 V has a 200-ohm load resistor and a 50-ohm loop resistance. If the maximum current in the loop is 20 mA, what is the voltage drop and how much voltage will be across the transmitter at 20 mA? A project manager prepares a work breakdown structure (WBS) identifying each major task and related subtasks required to fulfill the project objective. Subtasks are further reduced into units and subunits with associated cost projects and assigned responsibilities. This activity occurs during which phase of a project’s life cycle in the ISA CAP program’s model? What is Emergency Shutdown System (ESD) ?